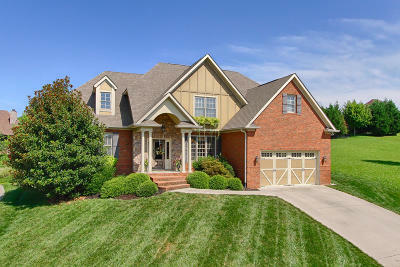 Beautiful Cottage Style Home In The Heart Of Farragut. 4 BR/3 BA. Open Floor Plan, Vaulted Ceilings and Hardwood and Tile Floors Throughout Main Level. Gourmet Kitchen Open To Two Story Great Room With 6-Burner Gas Cooktop. Designer Cabinets With Marble and Granite Counter Tops Throughout. Vaulted Beamed Ceilings In Main Level Master Suite. Extra Bedroom on Main With Ensuite Bath. Two Bedrooms Up With A Bonus and Walk-in Storage. Covered Front Porch. Central Vac, Full Irrigation, Fenced Backyard, Large Deck For Entertaining and Neighborhood Pool.